Click here to download capability folder. Established in 1948, Milward Alloys, Inc. produces aluminum and copper alloying additives for the metallurgical industry. Headquarters for our manufacturing facilities and corporate offices are in Lockport, New York, where a technological marvel - the "Flight of Five" series of Erie Canal locks - first raised and lowered commercial boats above and below the Niagara Escarpment in 1825. Our location is central between two Great Lakes and near the industrial regions of Buffalo, Niagara Falls, and Southern Ontario, including Toronto, Canada. Major population centers along the east coast and Midwest are also readily accessible. Modern transportation logistics make shipments nationwide and worldwide efficient and economical. Milward is certified to ISO 9001: 2008 practices and systems to ensure compliance with customer requirements for quality in metallurgical properties and performance characteristics. Under this internationally recognized standard, quality is monitored at every stage - from the input of raw materials to delivery of the finished product. We believe that melting metals in today's world must be done under adherence to strict environmental regulations. Major investments have been made throughout our history to uphold this belief. Milward Alloys operates a 73,000 sq. ft. complex that includes: alloy development and testing; copper alloy production and aluminum alloy production; aluminum direct-chill (DC) casting; extrusion; and administrative, warehousing and shipping facilities. 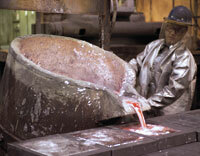 Sophisticated industrial research is essential to one's playing a leading role in today's competitive metals market. Milward is committed to ongoing emphasis on targeted research and continuous product development that enables us to bring state-of-the-art alloy technology to our customers. © Copyright by Milward Alloys, Inc.